PARIS — France declared a state of emergency and secured its borders Friday night after attackers unleashed a coordinated wave of explosions, gunfire and hostage-taking in Paris that left more than 120 people dead and generated scenes of horror and carnage. Taken together, the assaults represented the deadliest day of attacks in France since World War II and one of the worst terrorist strikes on Western soil since Sept. 11, 2001. At half a dozen sites across Paris — a soccer stadium, restaurants, a concert hall — the attackers carried out suicide bombings, hurled grenades and shot hostages dead in a frenzy of violence that paralyzed the city. Late into the night and early Saturday morning, heavily armed security forces flooded the streets while panicked residents and tourists sought safety indoors. Did the "terrorists" attack the government? A tax office? A bank? No. Instead they attacked "one of the best known music venues in Paris". Right. The above witness uses the number 3 copious times (the favourite number of liars). He fails to use "I" pretty much throughout his statement and uses "we" all the time. He says "We were taken to the police station to give a witness statement". I don't expect a dual Brit/Danish citizen to have such appalling English. If he was with someone else it's "taken to the police to give witness statements", plural. We took a circular stairs upstairs to the first floor of the cafe and up there were more witnesses and wounded people. Why are wounded people on the first floor in a cafe and not in an ambulance? The paramedics had arrived and were tending to people. We saw dead bodies and saw people – I saw a guy who had been shot in the stomach. It was horrendous. There was blood everywhere. And the one thing that struck me was about the blood in the movies and the blood in real life. In real life it is thick. I'm so glad he told us that, we wouldn't have known otherwise. The witness statement of the guy who took the footage of people running out of the back door of the music venue is a doozy. He lives on the second floor, takes his film, goes downstairs, gets shot in the arm and goes all the way up to the fourth floor to "some neighbours" to get some help, indicating no-one else on the ground, second or third floors in the building he was in who could give him any help. He also calls a doctor friend for an "American" who has been shot in the leg in order to get advice about using his shirt as a tourniquet. I've done a first aid course and a) they aren't recommended and b) using a shirt is not appropriate. I'm interested to see if they interview the American shot in the leg or if he's going to be added to the rising death statistics. French journalists claim Sylvain was saved from the blast of the explosion, not from gunshots or bullets. 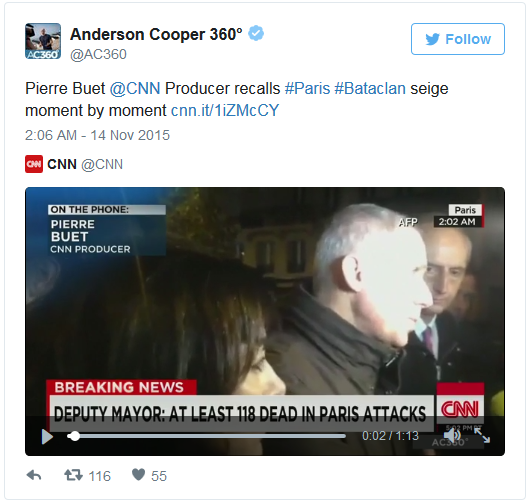 One journalist claims being in Bataclan and more eye-witness reports. Eye-witness reports have begun to emerge from people who escaped the Bataclan, the Paris concert hall where gunmen opened fire and took hostages earlier this evening, reportedly killing more than 100 people before a police raid ended the violence. Pearce: Well, I've seen two terrorists from my point of view with ak-47s Kalishnakovs entering the concert room and firing randomly to the crowd. People yelled, screamed and everybody lying on the floor. And it lasted for ten minutes, ten minutes, ten horrific minutes where everybody was on the floor covering their head and we heard so many gunshots. And the terrorists were very calm, very determined and they reloaded three or four times their weapons. And they didn't shout anything. They didn't say anything. They were in masks and wearing black clothes and they were shooting at people on the floor, executing them. And I was luckily at the top of the stage, in front of the stage, so people started to try to escape to walk on people on the floor and try to find an exit. And I found an exit when the terrorists reloaded their guns in the meantime, and I climbed on the stage and we found an exit. And when I went on the street, I seen 20 to 25 bodies lying on the floor and people were very badly injured, gunshot wounds. And I took a small girl, a teenager, she was bleeding very badly, and I run. I ran with her for like 200 meters and I found a cab, a taxi and I let her in and I said to the cab driver, go to the hospital and I have some friends right now who are still inside the Bataclan who are hiding because they are not sure if there are still terrorists in there, and they are hiding in some kind of room in the dark and they text me, and they are very afraid, of course, and they are waiting for the police to intervene, but it's been over two hours now and this is terrible. What happened was terrible. I mean, honestly, 15 minutes, ten minutes of gunshots firing randomly in a small concert room. I mean, it's not a huge concert room. It's a small one. 2,000 people were there maximum and it was -- it was horrible. Blitzer: Julian, with these terrorists you say you saw three or four, you say they were dress the in black. Were their faces covered with masks? Pearce: They were not wearing mask. They were unmasked. I've seen the face of one guy, one terrorist. He was very young. He was like 20 years old, 25 maximum. He wasn't wearing a beard or something. Like a random guy holding a gun, that's all. There were not masks. Blitzer: Did you hear any words coming out of his mouth? He speaking in French or Arabic or anything you could discern? Pearce: Nothing. Nothing. I heard nothing, just the yelling and screaming of the people. They didn't shout anything. They didn't say anything. Not Allah akhbar or something like this. They said nothing. They just shot. They just shoot. They were just shooting to people. Blitzer: So they weren't questioning anyone who they were, they would just look at someone and shoot and kill them is that what you're saying? Blizter: You saw 20 people shot and killed? At least 20 bodies there on the floor. Pearce: Yes, yes, I can confirm that. Some of them were dead. Some of them were very badly wounded, but it was a blood bath. The second acount comes from the French newspaper Libération, which attributes it to an anonymous witness. I was in the pit in the front, it was a concert where the music was loud, I heard cracking noises, I turned around, and I saw a figure with a baseball cap by the door in the back, he was shooting in my direction. People started to fall and throw themselves on the ground. I thought that the guy next to me was dead. I think that's the case. I ran, I jumped the barrier and I got out in the first movement of the crowd by the stage. I got out through the emergency exit on the opposite end of the room. We took refuge in a cafe, barricaded on the second floor. People believed us right away. It's a war here, there was gunfire again just recently, we can only hear sirens, we're waiting to be evacuated in a cafe on Boulevard du Calvaire. "Everyone got down and was walking all over each other after the gunshots. The stage caved in, there were so many people. I lay down against the sound console. Then 20 to 30 bullets were fired, they were shooting at random. I saw assault weapons. I walked on top of bodies, there was blood. In the street there were dead bodies." I was on the first floor of the venue. And I was with a friend and we were in the middle of a concert listening to the music, having a good time, and then all of a sudden we heard gun shots. They were quite high pitched; at first I thought it was a joke on behalf of the band. I thought they were maybe playing a joke on us. And I didn’t actually believe it. And the shots kept going and going and going, and people started screaming and people started ducking, you know, hiding behind the seats and the chairs. And that’s when we realized we had to get out. There were lots of people panicking but it was still quite calm. A group of us managed to escape through a safety exit that was near the first floor of the venue. We were in the stairwell… and they opened the doors... and we all ran out in the middle of the street escaping for our safety... I saw a few people down, I saw some blood, I saw someone who was shot in the leg. But I don’t think I saw anyone properly down, but it was quite horrible. I’m only realizing it now to be honest. “It was carnage,” Marc Coupris, 57, told the Guardian, still shaking after being freed from being held hostage at the Bataclan, a popular concert venue. "I was in the pit, when suddenly I heard noises, like fireworks. At the time I thought it was part of the show, then I turned around and I saw a person who had just taken a bullet in the eye. She grabbed her head and collapsed. Then, everyone got on the ground, we were hearing shots. The shooters were shooting at random at people who were lying down, everyone was playing dead but it didn’t make any difference for them. I was lying in the fetal position but my feet were blocked by someone’s body. I managed to slide my feet out of my shoes and I ran backstage, because an exit was just nearby, with three other people, who were injured." "I locked myself in a bathroom upstairs, there were four of us in the bathroom, they didn’t come there. They were guarding the hostages, and I heard them talk with them. They were saying that they had 20 hostages, but I didn’t go see and verify. … I heard them trying to negotiate with the police out the window. I clearly heard them say to the hostages, “It’s Hollande’s fault, it’s your president’s fault, he doesn’t have to intervene in Syria.” They also talked about Iraq. … Then we heard shooting when the police intervened. There was shooting in all directions, there were more explosions. The police opened the door (of the bathroom) and told us to get out. They asked me to take off my shirt before leaving, to be sure that I didn’t have a bomb on me." Thanks for clarification. 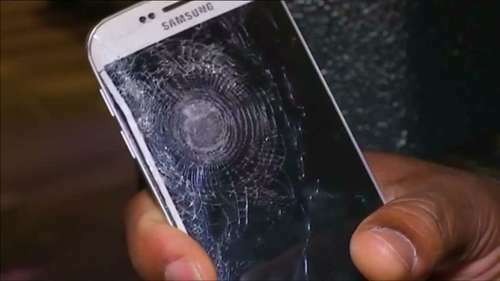 I now understand that the smartphone is shrapnelproof. Years ago, my mother gave me a bullet...a bullet, and I put it in my breast pocket. Two years after that, I was walking down the street, when a berserk evangelist heaved a Gideon bible out a hotel room window, hitting me in the chest. Bible would have gone through my heart if it wasn't for the bullet." Last edited by Rudy Algera on Sat Nov 14, 2015 11:25 am, edited 1 time in total. A co-founder of the Free Gaza movement, Mary Hughes-Thompson, proposes a possible alternative to the usual Islamic trail. French Performance Art ... (folies-bergère-style) at the Bataclan de Paris! Please also note at the 2:15 timemark one of the alleged deadbodys lying on the street is browsing the internet on his smartphone. 1. Never forget to bring your passport! minutes 6.30 what is this a kalashnikov sign ?